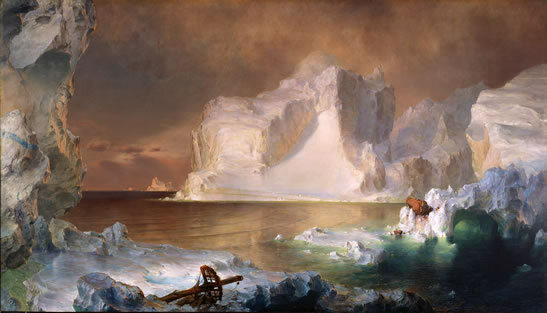 One of the most popular works of art in the Dallas Museum of Art’s collection is Frederic Edwin Church’s The Icebergs. Although there are many reasons to treasure this painting, I love the connections with science and history. With an interest in the 1845 Franklin Expedition to find the Northwest Passage, Frederic Church and his friend Reverend Louis Noble set sail during the summer of 1859 on a month-long journey to Newfoundland and Labrador. Church’s romantic notion of exploring new frontiers and recording the untamed natural world resulted in multiple sketches of icebergs. Reverend Noble documented their experiences and published the book After Icebergs with a Painter: A Summer Voyage to Labrador and Around Newfoundland in 1861. Approximately 40,000 medium-to-large sized icebergs annually calve, or break, off glaciers in Greenland; 400-800 icebergs make it as far south as Newfoundland and Labrador, Canada. The age of the ice may be more than 10,000 years old. The average size is between three and 250 feet above sea level with an approximate weight of 100,000 to 200,000 tons (the weight of 20,000 school buses). About 7/8 of the iceberg’s mass is below the water. The bluish streaks in the ice are from the refreezing of melted water without air bubbles. Icebergs often tip over and roll as the ice unevenly melts. Depending on the size, icebergs can “ground” or contact the seabed and get stuck. When you come to the Museum, I encourage you to wander up to the 4th floor to see this work of art. Consider the awe and wonder of these natural formations that were observed on the North Atlantic waters. You might want to bring a jacket or sweater in case you need to keep warm on your adventure! For more information about The Icebergs and its history, read The Voyage of the Icebergs: Frederic Church’s Arctic Masterpiece written by past DMA curator, Eleanor Jones Harvey. It is one of my favorite painting, I can stare at it for a day.